Despite decades of performing, several things remain constant: a seemingly endless catalog of creative compositions, free-style improvisations that almost always defy expectations, and surprisingly coherent arrangements that often seem on the brink of disintegration which is now augmented with our musical friends from New York. The Instant Composers Pool (ICP) was founded in 1967 by European music legends Misha Mengelberg, Han Bennink and Willem Breuker. 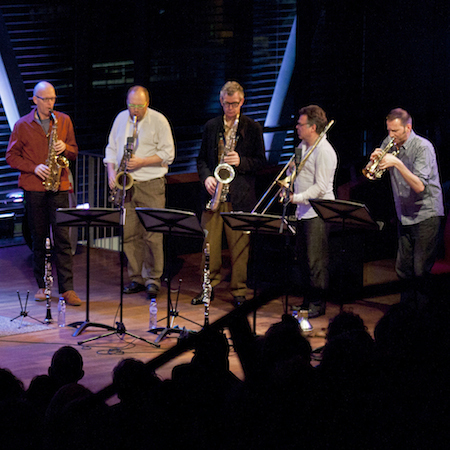 The artistic vision is the “ICP method”, and the band has achieved international acclaim for its sophisticated improvisations, ingenious interpretations of landmark composers such as Ellington, Nichols, Carmichael, Monk, Mengelberg, and for the band members’ extraordinary level of musicianship. It’s a blend of European improvised music, jazz and an irreverent attitude, in general, which all combine into a smart yet enjoyable music that has astonished and impressed music lovers for several decades. Special Thanks to the Foundation for the Performing Arts, the Hague.